Jerky, dried fruit, and vegetable chips are all delicious, shelf stable snacks that can be used to feed a family during a road trip. They can also make great, healthy snacks at home, at work, or at school. Using a food dehydrator is easier and gets better results than putting foods into the oven to dehydrate. Finding the best food dehydrator requires a bit of know-how. To choose the right dehydrator for my family, I spent time online researching units and reading reviews. I spoke to friends who have already chosen their dehydrators to better understand their experiences. And I eventually chose the right dehydrator for us. Just above, I have created a chart with the overall features of my favorite dehydrators and links to their current prices on Amazon. If you look below, you can see a complete review for the dehydrators I liked best, as well as the one I ultimately chose. What Do You Need In A Food Dehydrator? If I let them, my kids would eat their weight in dried fruit snacks, and I absolutely love the taste of kale and carrot chips. My husband, meanwhile, absolutely adores jerky. To find the right food dehydrator for all of our needs, I had to start doing some research. Here are a few of the details that went into finding the best dehydrator I could for our family. First, I needed to understand more about how a dehydrator really worked. The goal of a dehydrator is to remove most of the water from foods. They do this by using heat and air flow to dehydrate items. It is important that heat and air flow is kept consistent to allow foods to dry evenly. 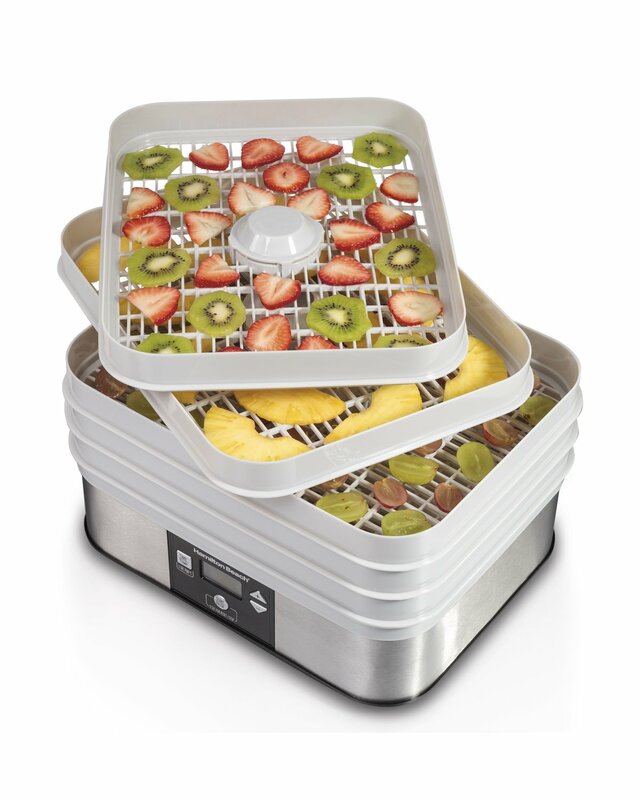 To dry foods, the dehydrator moves heated air very quickly within a small space. The number of racks influences how much food you can dehydrate at one time; in general, the more shelves the better, so long as there’s room for food to be contained within the shelf. Some dehydrators are made of stacked shelves, while others have a box-like shell to contain the shelves on racks. The number of racks possible contribute to overall capacity of the dehydrator, but aren’t the entire story. Do you have a big kitchen with plenty of space for every kind of kitchen equipment you could wish? Must be night! My family has a reasonable kitchen with some extra counter space, but I do need to be careful with what I buy and how much room it takes up. For this reason, I was very careful about choosing the right dehydrator for our family. Paying attention to the overall footprint of the dehydrator was important to making sure the dehydrator could be used regularly as needed in our kitchen. While stackable dehydrators are convenient, easily modified, and many shelves can be stacked on top of each other, they are notoriously uneven after a certain number of shelves. If you have a lot of food to dehydrate, you may find that you need to regularly rotate shelves with these models, which can be frustrating and inefficient. If you only need to worry about a few trays of food at a time, however, they can be much more affordable than the box models, and keep food adequately and evenly heated. To make sure that foods are dried properly and can be stored as long as possible, I wanted to make sure that the dehydrator we chose would heat food evenly and thoroughly. Some units use a fan at the back or bottom of the unit to circulate air and speed food drying. Other dehydrators use convection drying, relying on a heat element to create the right conditions for drying foods. This is done because some manufactures are concerned that using a fan could cause introduce dust into the food, potentially contaminating it. The best dehydrators use both a heating element and a fan to maximize drying capacity in the shortest time possible. Convection heat units are quieter and use less electricity, but they take longer to dry food. For many foods, rapid drying is necessary to maintain flavor and keeping time. Different foods have different ideal temperatures, from herbs to veggies to jerky. 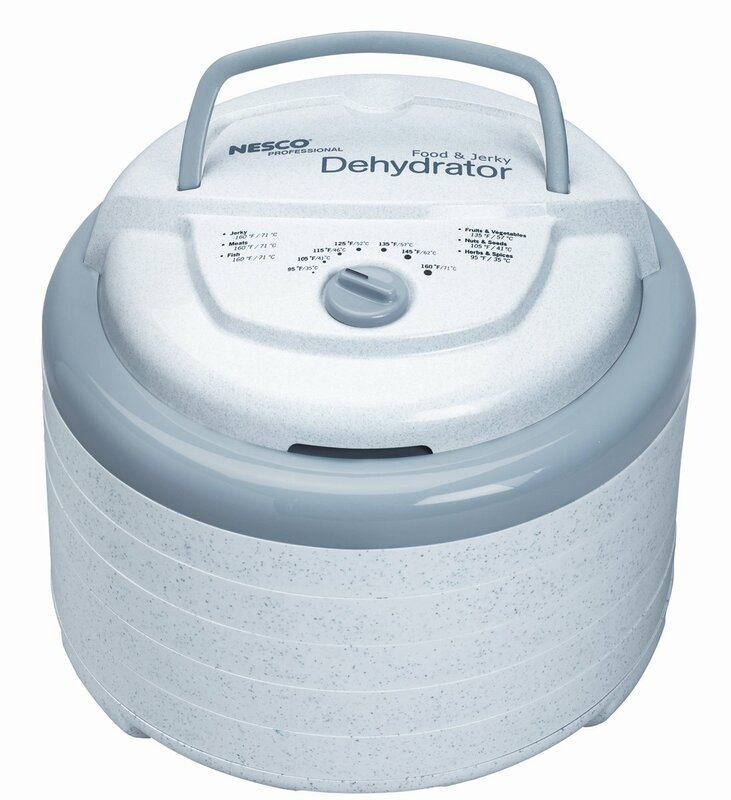 The best dehydrators have an adjustable thermostat to control the heat of the unit. This allows me to maintain consistent temperatures that are right for the foods being dehydrated. Since the key to successful and flavorful dehydration is consistency, so this feature is crucial to a well-functioning unit. The thermostat doesn’t indicate the temperature of the air around your food, but the temperature your food is expected to reach. Reaching the correct temperature is particularly important for jerky and other dried meats, to make sure that all bacteria is killed off and food will not be harmful. Much like microwaves, wattage is a rough gauge for how powerful a dehydrator will be. A higher wattage unit might have a more powerful heating element or a stronger fan; some units have dual fans to manage their higher capacity. Wattage is primarily an indication of how much electricity a unit will use, which is helpful to know if you already have a lot of appliances in your kitchen that use a lot of electricity. You could overload a breaker if you’re already close to capacity, or you could see a big increase in your electric bill if you’re using your dehydrator consistently. For my family’s dehydrator, I wasn’t particularly concerned about the exact wattage of the unit; I just wanted to focus on quality and usefulness. The Magic Mill is a box type unit with six shelves that measure 12” x 13” each. The dehydrator has preset temperatures, and can dry for up to 19.5 hours, meaning you could set it to run overnight while you rest. Air flows horizontally, from back to front, and offers a temperature range of 95F to 158F, which is a wide enough range for most applications. The unit also comes with silicone sheets that can be easily washed after foods are dried. The fan on this unit isn’t loud, but isn’t silent; it sounds approximately as loud as a small refrigerator in another room. It uses a loud beep to let you know when the drying cycle is complete, which can be annoying if it finishes at two in the morning. Since each tray is removable, you can dry larger foods, even if they are taller than the height of the trays; you can also use the unit to make yogurt or other foods that require low, consistent heat over time. 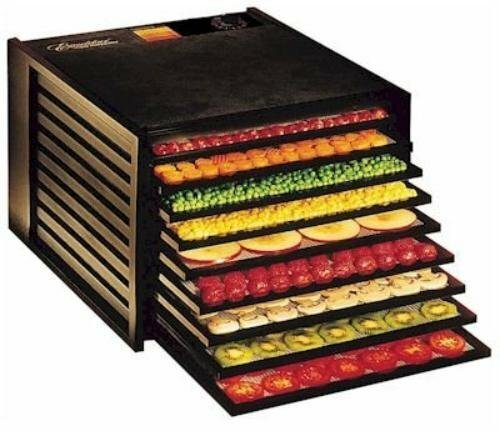 The Snackmaster is an example of a stackable dehydrator unit. The original unit ships with 5 trays, but you can buy more to stack, up to 12. After 12 units, the quality is likely to begin to fall off because the air won’t circulate properly. The Snackmaster forces air down through each tray, which then moves throughout the unit to dry and dehydrate food. Since the heater and fan are mounted on the top of the stack, drips don’t run the risk of damaging the motor or heating elements. The thermostat is manually adjustable from 95F to 160F, allowing you to choose the right temperature for the food you’re drying. The nice thing about stackable trays is that you can use the right number of trays for what you’re drying. If you need more capacity during harvest season, you can add extra trays; if you need fewer trays during the rest of the year, you don’t have to use all the trays in each application. 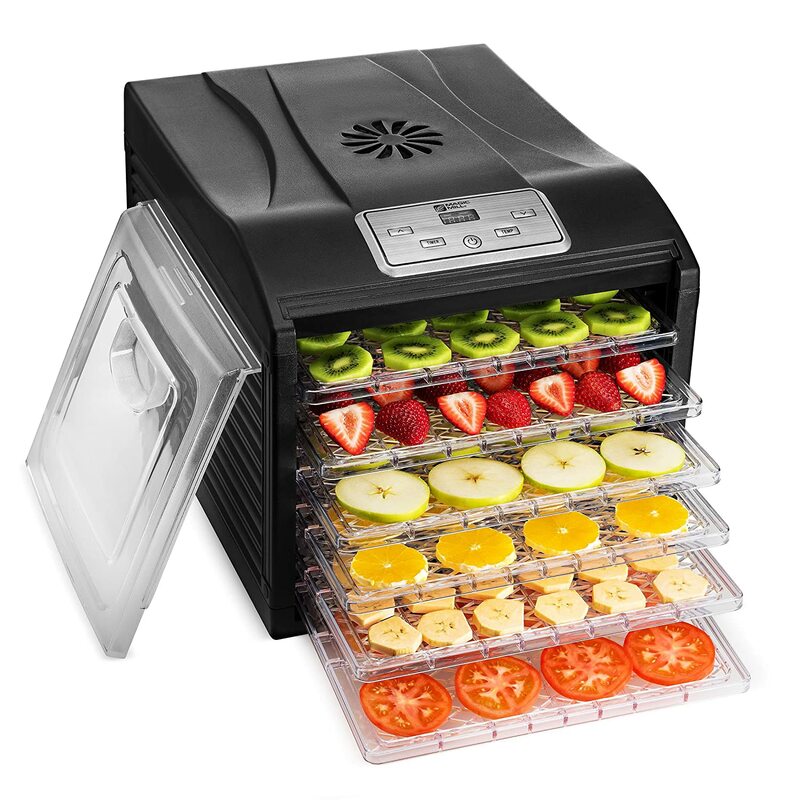 The Hamilton Beach food dehydrator is a small, rectangular unit, with five stackable trays and a clear lid so that you can watch the progress of your fruit leather and sun-dried tomatoes. While you can use fewer trays if you have a smaller amount of food to dry, you don’t seem to be able to buy more trays to expand the capacity of the unit. The range of the thermostat is also slightly smaller than other, similar units; the digital thermostat of the Hamilton Beach is from 100F to 160F. This can be important if you are drying herbs, which are particularly sensitive at the low end of the temperature scale. The timer on this unit can be set for up to 48 hours, giving your food plenty of time to dehydrate. Each tray is about 1” tall, so it is important for foods to be cut smaller than that so that trays can stack properly. 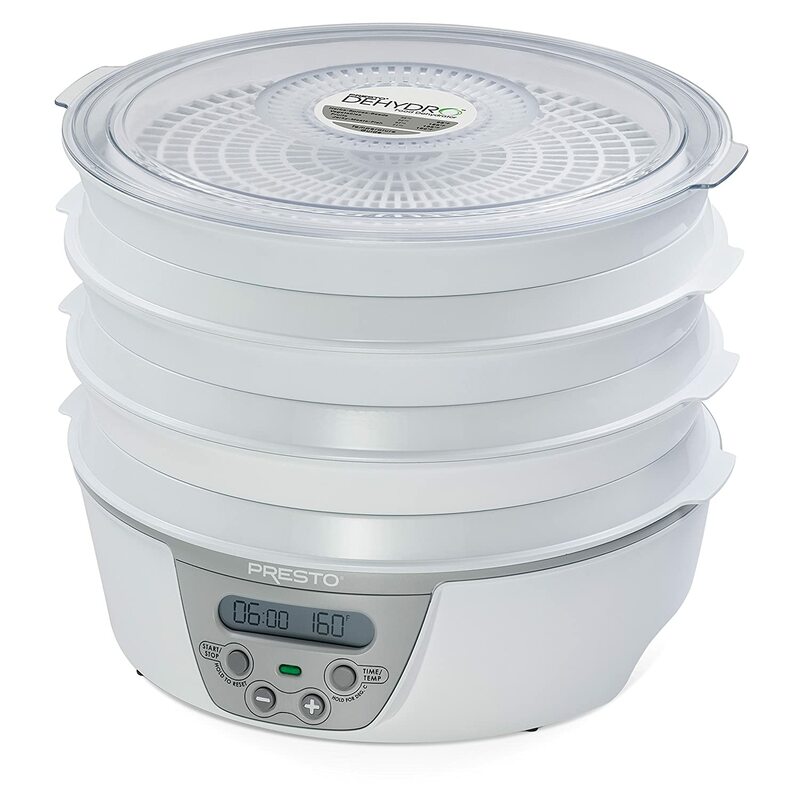 Shipping with 6 trays and expandable to 12, the Presto Dehydro has a digital thermometer that ranges from 90F to 165F, giving you plenty of range for dehydrating foods. It also includes a timer so that you can be precise with your recipes. The unit’s heater and fan are bottom mounted for great circulation and even drying. One of my favorite features of the Presto is that when trays aren’t in use, they can be stacked together. This greatly reduces the space this unit takes up when it’s not on the counter. This also features a see through cover so that you can watch the progress of your food. That said, my friend with this unit noted that drippings from jerky could get down into the bottom of the unit and be difficult to clean. His solution was to put one of the solid sheets that you use for making fruit leather on the bottom stack of the dehydrator. This caught the drippings and was easy to clean afterwards. 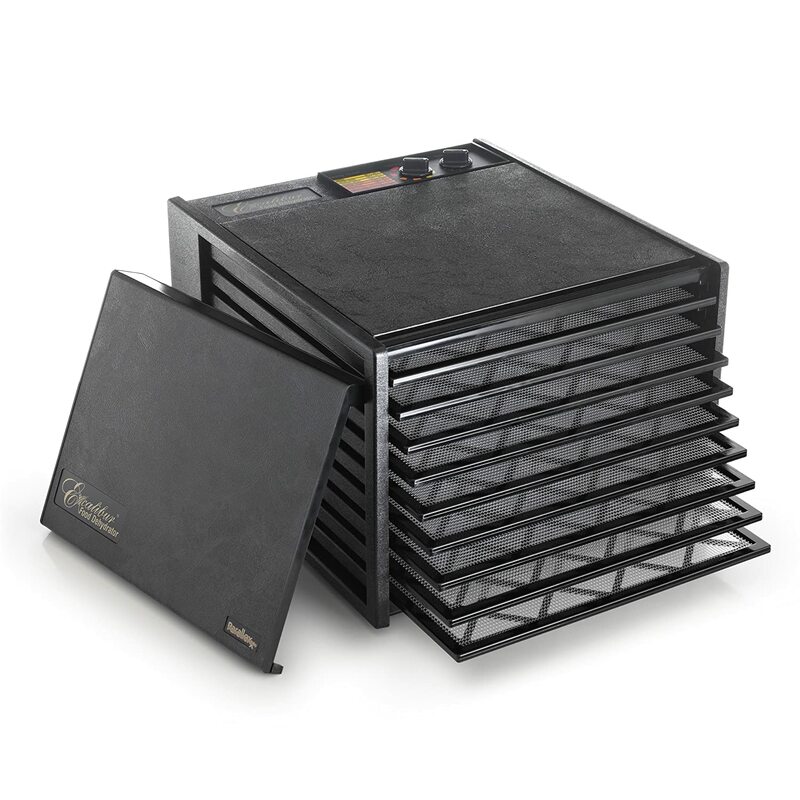 For another box type food dehydrator, the Excalibur unit features 9 removable trays without taking up much more of a footprint than the 6-tray units. You can remove trays for taller food items, or take them all out to make yogurt, rise bread, or make cheese. If you have a big family, need to dry food during harvest times, or just like to make big batches, this dehydrator could be perfect for you. The trays are also dishwasher safe for easy cleanup. Similar to the 9-tray Excalibur model, the 3926TB has 9 removable trays that allow for plenty of room inside the dehydrator. Removing all of the trays allows you to use the inside like an oven for yogurt making, bread dough rising, and more. The temperature range on this Excaliber model is somewhat higher than other dehydrators, going all the way to 165F. For some types of jerky, this may be safer than the lower 155F used by other models. 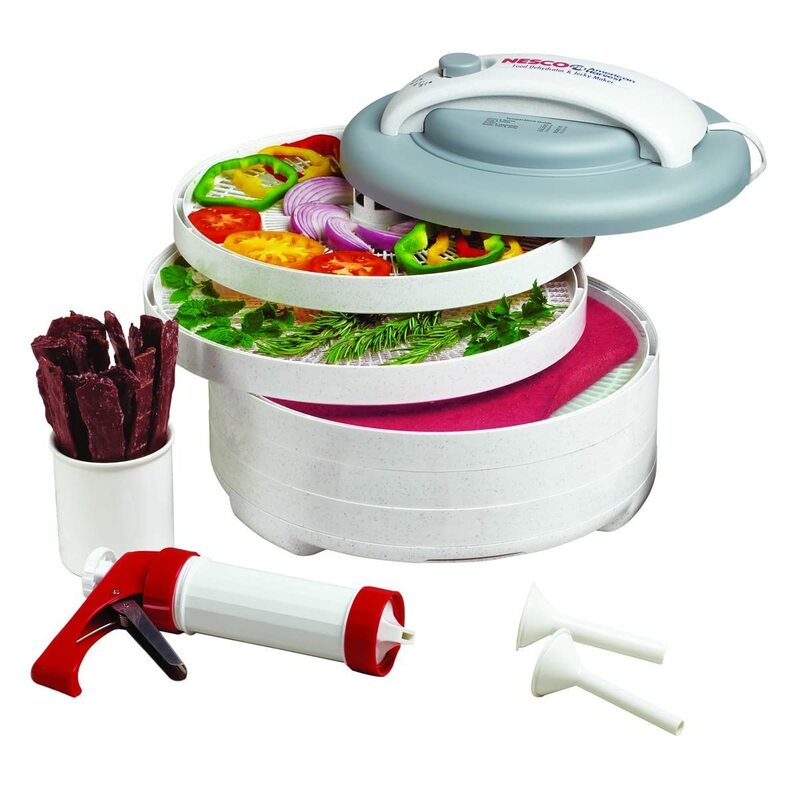 With many dehydrators, you get a number of trays and a few accessories, this stackable model comes with everything you need to get started with food dehydration. Jerky cures help you make great jerky from the beginning, and fruit roll sheets let you make your own fruit leather without causing a huge mess in your dehydrator. After a lot of consideration, I decided to choose the Excalibur 3926TB. While my family does tend to dehydrate a lot of different foods, we don’t tend to need huge batches of anything at a time. Using six trays is plenty, and I just rotate what’s being prepared on a given week or day. I appreciated the extra features the Excalibur 3926TB can offer, such as making yogurt or cooking rolls. I also liked that I can remove trays, if I need to dry foods that are taller than a typical stackable tray.